Archer McRae Beverages is bringing JOIY to the world – and revolutionising traditional wine business in the process. 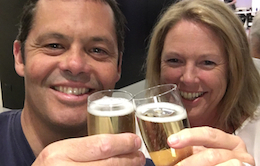 Aimed at a modern and youthful market - JOIY is a natural, sparkling wine produced by founders Chris Archer and Cath Hopkin (pictured), and it’s making a big splash all over the world by creating a new category of Lifestyle Wines. JOIY is consumed in new and innovative ways – straight from the bottle with a sliver of lemon and a straw, in a flute or turn into a delicious cocktail. With chic mini bottles and stylish packaging for sophisticated convenience, JOIY appeals to all occasions and lifestyles.Currently exporting to 7 major international markets with production partners in two of them. Original generation time 3.7813 seconds. Cache Loaded in: 0.0006 seconds.